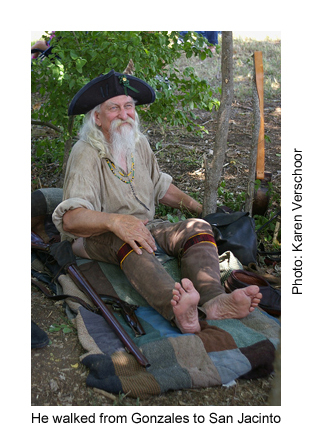 The modern day "volunteers" are also from all walks of life, with as many different outfits as there are persons. They appear a bit cleaner than our ancestors-despite strong urging by their leaders, few re-enactors agree to roll in the mud before they show up! However, some do come with torn clothes, stains and unshaven faces. 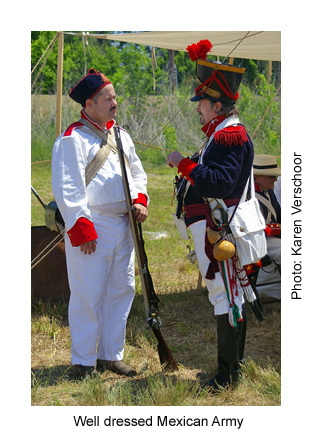 Volunteers must be approved in advance in order to participate in the re-enactment. No "walk-on" volunteers are accepted. Authenticity and experience is a requirement. Safety is one of the highest priorities and each volunteer is required to make safety meetings before the event begins. The re-enactors chose which side they want to fight on, but sometimes they are recruited for a specific camp in order to balance the numbers. Over the years many volunteers have fought on both sides. However, the final result is always the same: The Texas Army wins! Each volunteer brings his or her own outfit which, with other equipment and gear, can be worth upwards to a thousand dollars. Many travel from New Mexico, Louisiana and far-off parts of Texas to participate. 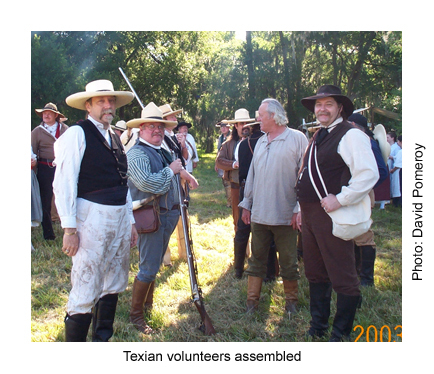 Like the variety of volunteers in 1836, the re-enactors are doctors, lawyers, welders, carpenters, small business owners, teachers, housewives, secretaries, managers and retired persons. Despite their background difference, each has three objectives in mind: first, know their history; second, share that history with the public; and third, have fun. 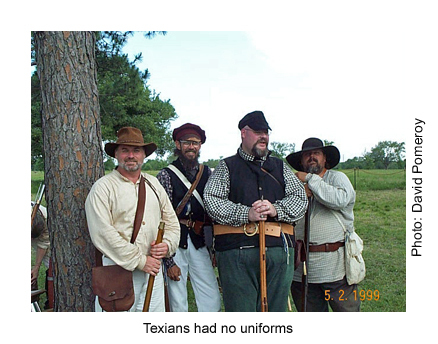 Early Texas volunteer Noah Smithwick summed up the attitudes of the 1836 volunteers: "The citizens had taken up arms in self-defense; another class had come through sympathy with their struggling countrymen; others, still, for love of adventure..."
In the Texian Army Camp spectators visit with the soldiers and inquire about their clothing, weapons and reasons for fighting for Texas. 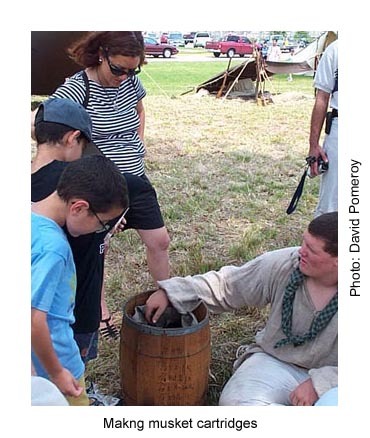 Gunsmithing, black powder cartridge making, blacksmithing, musket ball molding, leatherwork and whittling are demonstrated. 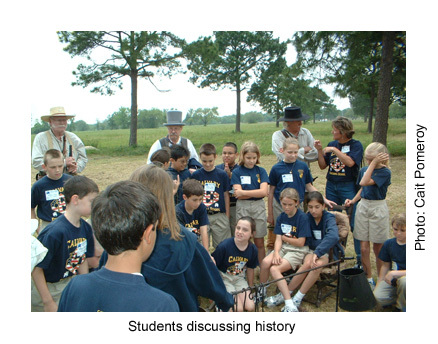 Young spectators are pressed into service as a militia where they are trained in the manual of arms and marching. Some are even selected to man the famous Twin Sister's cannon. 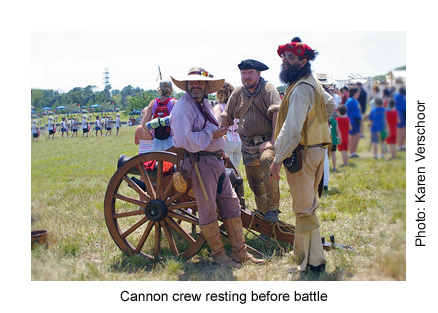 Periodically the re-enactors are mustered and fire salutes, either with black-powder muskets, pistols or cannon. This is always a delight for the spectators. Across the battlefield is the Mexican Army Camp. This camp has a more traditional military look, with its neat row of white canvas tents and uniformed soldiers drilling. Young spectators are also drafted into the Mexican Army but must learn their orders in Spanish. 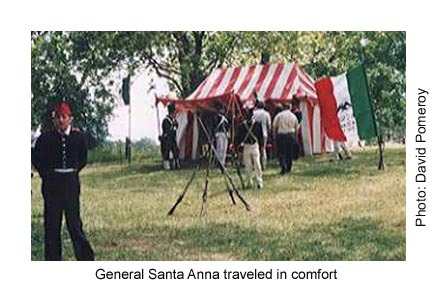 General Santa Anna traveled with a red and white marquee tent, fully furnished with silver and china. Visitors are encouraged to look inside. Flying outside his tent are several of the Mexican flags replicating those at the original battle. If you are lucky, a surgeon will be on duty and will demonstrate the tools and medicines of the day. Normally his presentation is interrupted by groans and yells of pretend pain at the primitive implements used in 1836. Nearby the wives, girlfriends, family, and other camp followers are cooking and mending clothes. The public is encouraged to sit and visit for a while.